Formative assessments are an excellent way to track students' progress. 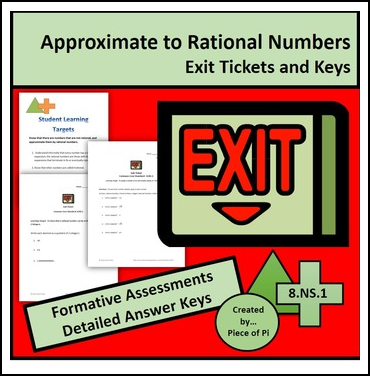 These exit tickets/mini quizzes are aligned with the common core standards in mathematics (8.NS.1). They can also be used as bell work or "do now" problems. Please note...This resource is included in my Whole Pi Growing Mega Bundle. Check it out for some awesome savings! Perfect for the pre algebra teacher! 3. Answer keys - provided for parents, tutors, and home-schoolers to get immediate feedback. I use exit tickets weekly in the classroom. It helps me to see which students needed remediation or enrichment. My 8th graders raised their proficiency levels to 97% proficient, accelerated, or advanced in the Ohio Achievement Assessment. I was thrilled with their progress! Practice makes perfect! Look for the green star next to my store logo and click it to become a follower.Voila! You will now receive updates about this store.